What a whirlwind these last few weeks have been. Out of nowhere I got news that my birth mother, Rachel, had passed. It’s been a lot to process. I have known my whole life that I was adopted. It has never really been a self-defining part of my life, and I always had in the back of my mind the motivation to track down my origins and see if I could get to know my biological family. Years came and went. Every couple of years I’d get motivated to progress things. I obtained my original birth certificate, located a name, located a home address from the 60’s. Then I’d hit a roadblock and have to park the search. Over time, the Internet evolved and around 2007, my mother (well, someone with her name and broad location) popped up on a genealogy website. I had confirmation. She (I thought it was her) was alive. I found someone with her surname in the local telephone book, and one night made the call from Auckland to Somerset, UK. I finally had a current address. I had actually forgotten over the last decade who the person on the end of the phone was, and was delighted to meet him at Mum’s funeral. He’d kept the secret. So around Christmas 2007 my mothers life irrevocably changed. As did mine. I met her for the first time in 2011. The memories from that occasion flood back with such clarity. And now I find myself in Somerset, saying goodbye. It’s been hard. The grieving process has been brutal and now the healing begins. I am so grateful to my cousin who has been handling everything – I think we’ve helped each other get through this time. 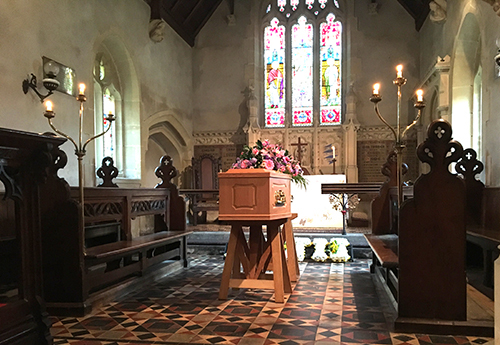 The funeral was lovely. In a setting steeped with history and legacy. I was proud to be able to address the congregation with some thoughts. I have posted this below for posterity. So now I continue to sit, and to think, and to process. We are here today to celebrate the life of Rachel, my mother. Everybody here has memories of Rachel. Each memory is different, each memory personal. Each memory is a piece of the puzzle that when collected together presents a picture of who Rachel was. That’s the great thing about life. People, all of us, have the opportunity to impact others and leave behind a lasting memory. My story is a little different to most here and I’d like to share some of it. Rachel was an adventurer. She went to New Zealand to have an overseas experience decades before that became a common thing for young people to do. I was an outcome of that adventure. Growing up with my adoptive family, I always felt… different. I think differently to them. I see the world differently to them. I certainly have a mischievous streak and a wanderlust that did not come from the nurture I received. It was always in the back of my mind that I needed to find out more about who I was. It was around 2007 I think, that I tracked Rachel down. All I had was a name on an original birth certificate and a very basic Internet. I remember finding a Somerset Sealey (I can’t remember who it was) and making a telephone call to locate Rachel’s current address and to ask if he thought it would be ok if I wrote. Mum received that letter shortly before Christmas Day. And I know her world changed. I like to think for the better. It wasn’t until 2011 that I was able to come out here to meet her for the first time, and meet many of you here today. My blood relatives. I remember arriving at London Heathrow and seeing her in the arrivals hall quite clearly. Thank you Mo for being there at that time also. That moment in 2011 was a time where some of the missing pieces of my own puzzle were located. And placed. Rachel and I were able to get to know each other as adults without the angst of a parent-child relationship getting in the way. She was desperately proud of her family here and she loved telling me about all what you were doing. She was delighted to get to learn of her grandchildren, my son Aidan and daughter Caitlin, their strengths and interests, and to see her heritage passed on. Rachel and I realised early on that I am definitely cut from the same cloth as her. My extreme curiousity comes from her. My off-beat sense of humour comes from her. At this time I would like to acknowledge my birth Father, Phil. 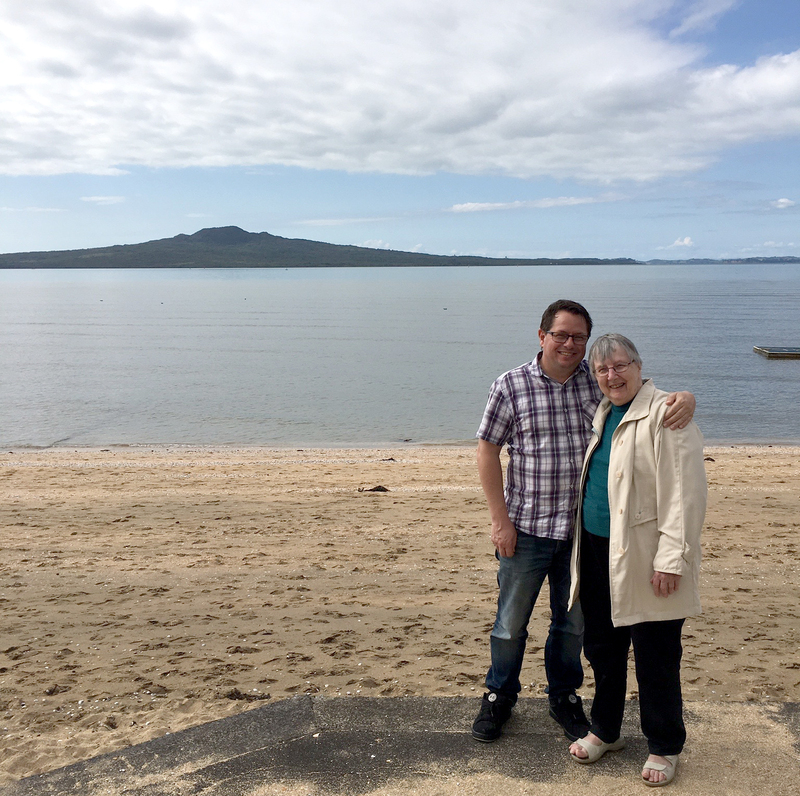 I am so grateful to him as he made it possible for Mum to come to New Zealand in 2016 to see me in my habitat, and also to meet Aidan and Caitlin and give them an opportunity to meet and get to know their grandmother. He sends his condolences to us all. Rachel reflected to me that she felt that she and Phil were incredibly selfish when they gave me up for adoption. I told her that far from being selfish, her actions at that time were completely selfless. Because of her, I have had a good life, raised by great parents, knowing nothing but love. And now Rachel is gone. In me, in her grandchildren. I know that she wouldn’t be comfortable with all this attention but I also know that she would be ‘right chuffed’ as to what is happening here. I feel a strong sense of responsibility to ensure that this connection grows and strengthens. That this connection endures. The puzzle that is Rachel may be completed today, but there are more puzzles to complete. More pieces to find and to place. I hope that you will help me as I honour her memory through living and in some way, perhaps, I can help you also.